Vision thrives on partnerships — often with businesses which are involved in many different ways. That's because they see Vision as a good way to give back to the community who support them, to give back to God who blesses them, or simply as a good way to let people know about their message. Using Vision to get your message out is a win-win because you can tell everyone about your business, and it helps us financially too. Advertising on Vision is best suited to businesses and others with a national footprint, in line with our national programming approach. Click here for our Advertising Info Pack. Vision For your Business is our brand new initiative aimed at encouraging, equipping and connecting Christian business people across Australia with tools and resources to assist in building God centred businesses. Read the latest articles and sign up for our monthly newsletter. Many businesses support Vision financially. Some give regular support (monthly, quarterly or yearly) and others support a particular project (starting a Vision Christian Radio station or supplying copies of The Word for Today to prisoners, etc). We also have a Small Business Partnership programme which starts at $100+GST per month and includes some on-air thank you's. Click here for more details on how to make a donation or become a Small Business Partner. * We can provide you with customised signs or artwork to promote Vision's ministries in your shop, email communications, website, on your car or on your truck! 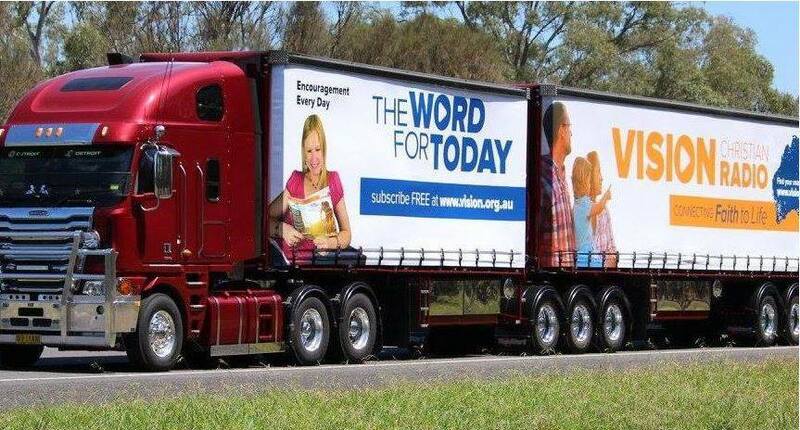 * Ask us for copies of The Word for Today or Vision180 Magazine to have available for your customers. If prayer is a vital part of your business, then we invite you to pray for us while you're at it. Prayer is powerful and an absolutely necessary part of our work. Each month we produce a prayer calendar to let you know about specific things or people you can pray for. Click here to become a Vision Prayer Watchman.